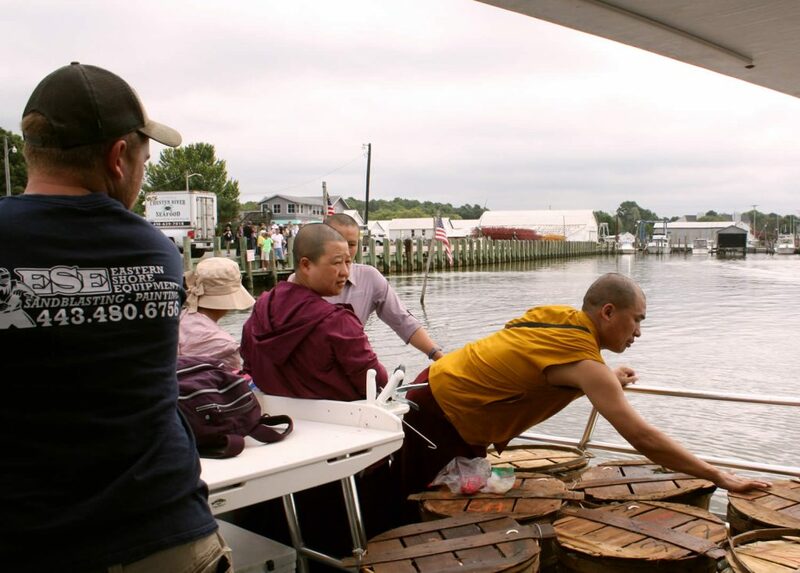 Early on the morning of Sunday August 19th—the auspicious and joyful occasion of Her Eminence Jetsün Khandro Rinpoche’s birthday—sangha members, gathered for the Mindrol Lekshey program at Lotus Garden, traveled to the eastern shore of Maryland to make offerings in Rinpoche’s honor by performing a tsethar or life release ceremony. 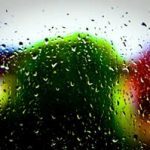 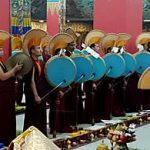 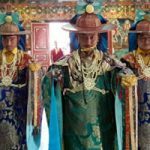 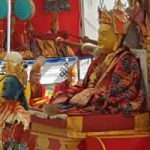 The practice of tsethar is considered as one of the most skillful methods of gathering merit since it involves the granting of life to a being and releases it from the great fear and torment of imminent death. 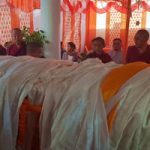 It is said to be especially beneficial to perform this practice as a prayer or supplication for the long life of one’s guru or any individual. 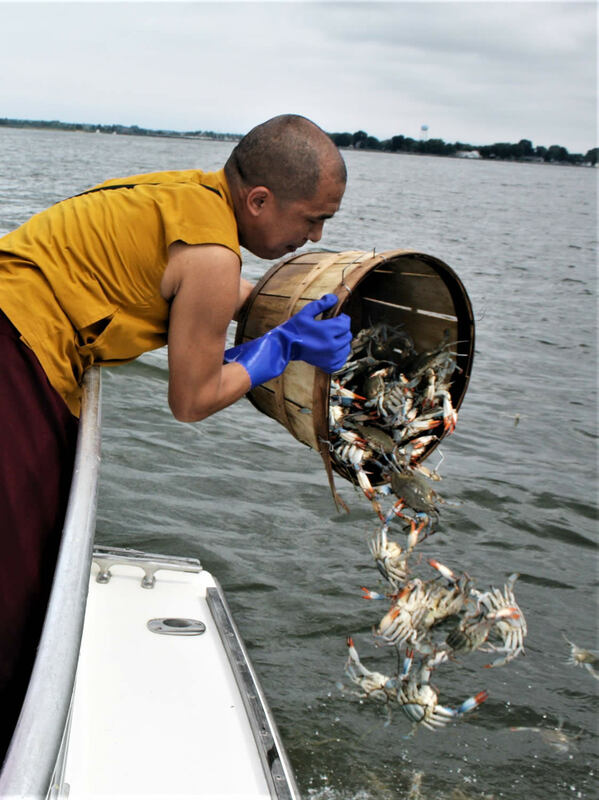 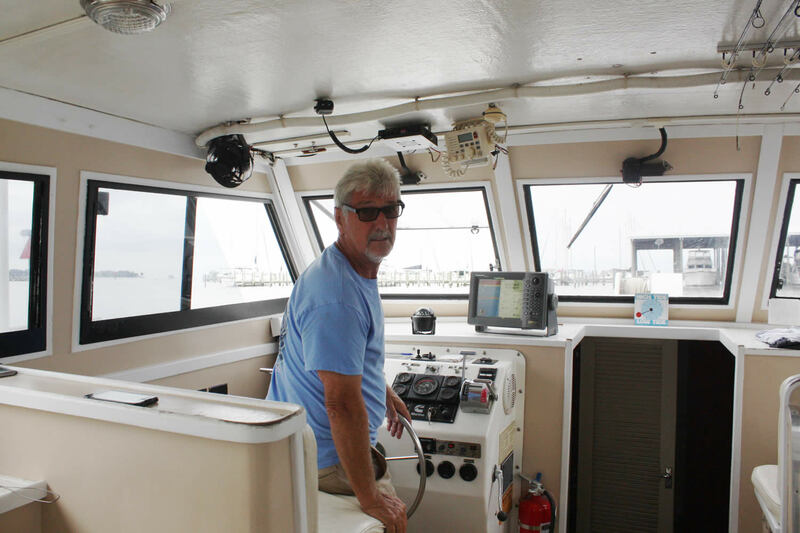 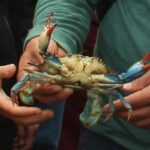 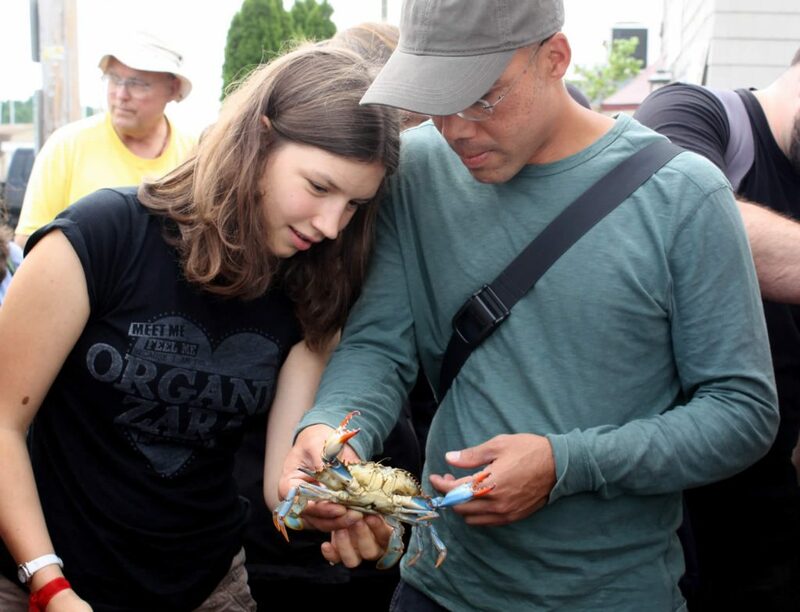 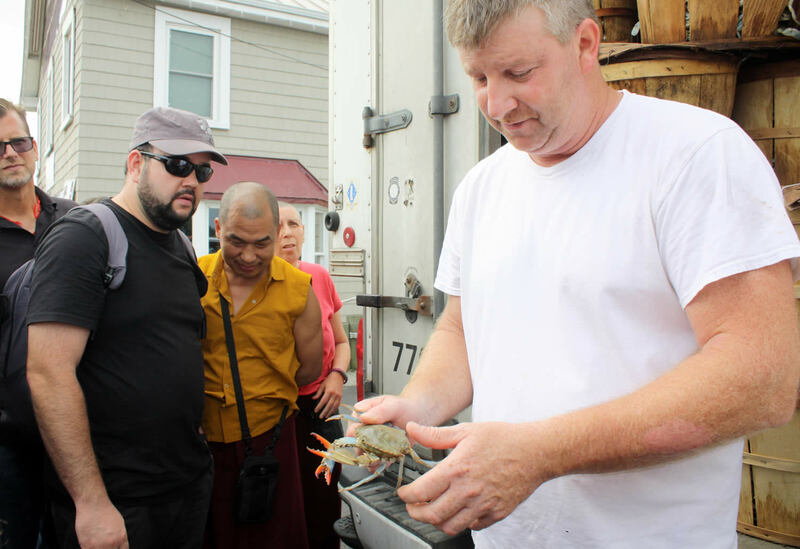 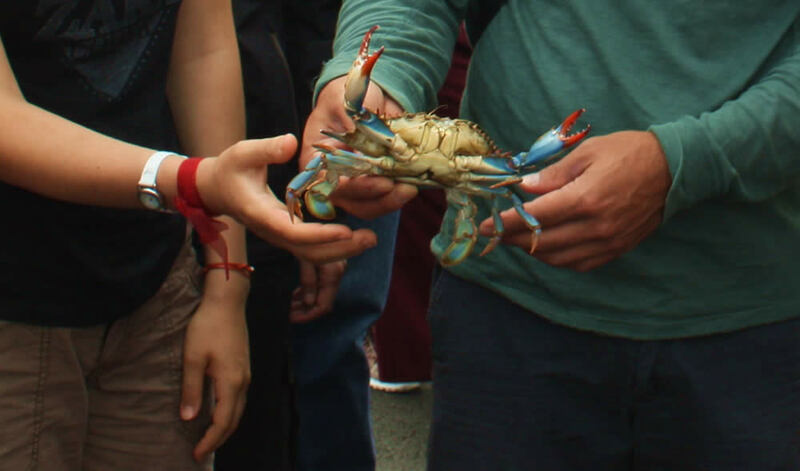 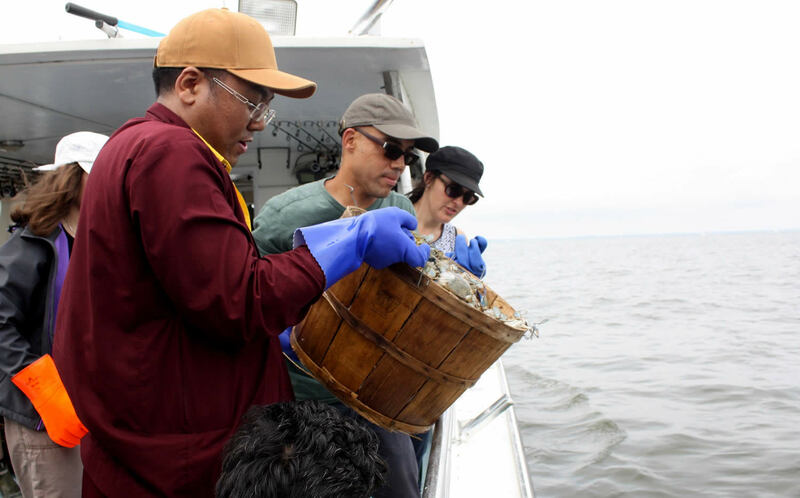 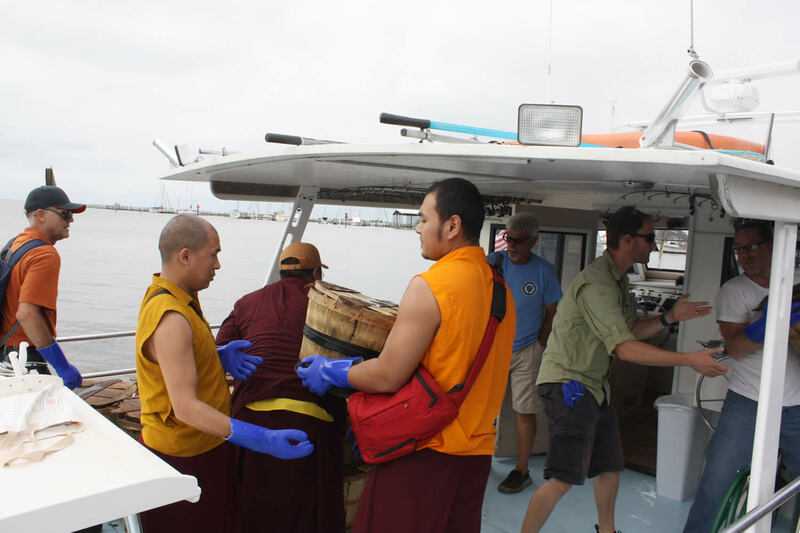 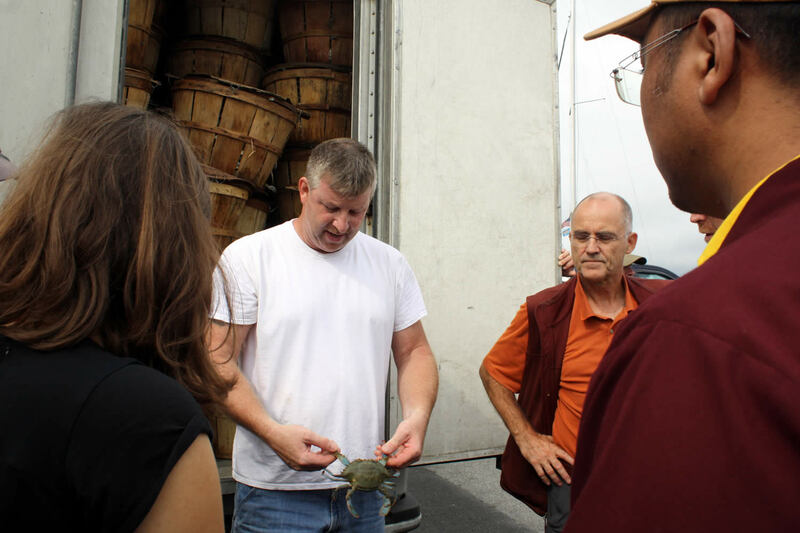 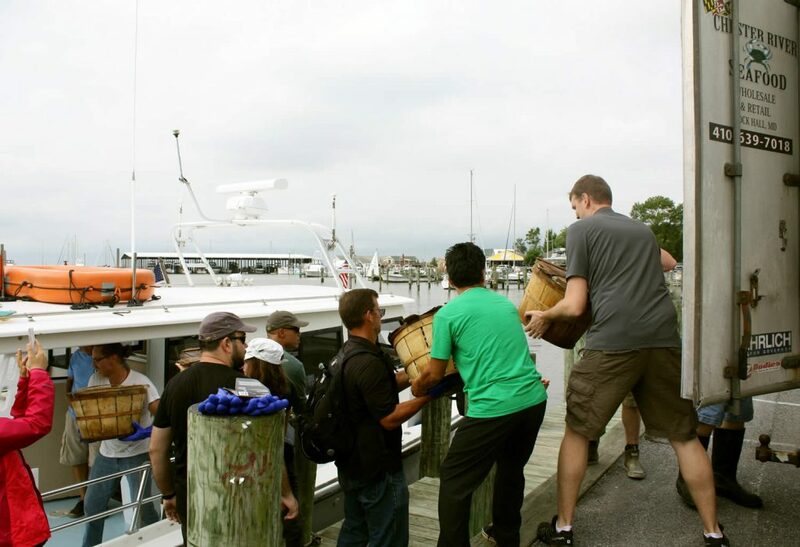 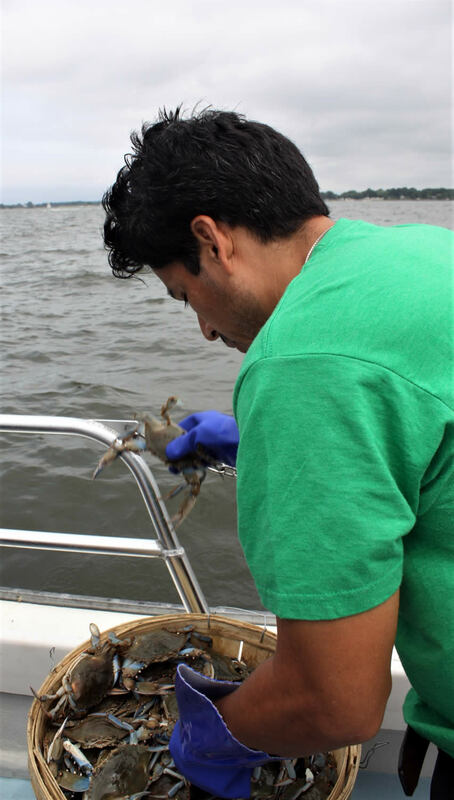 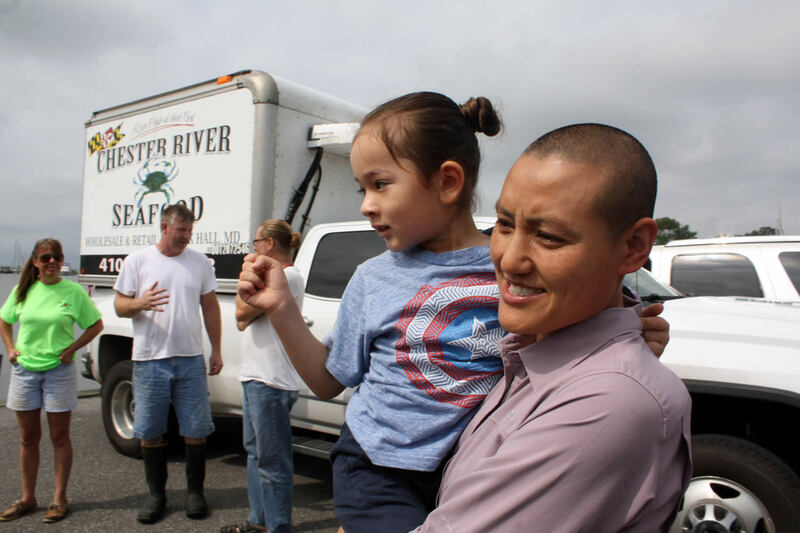 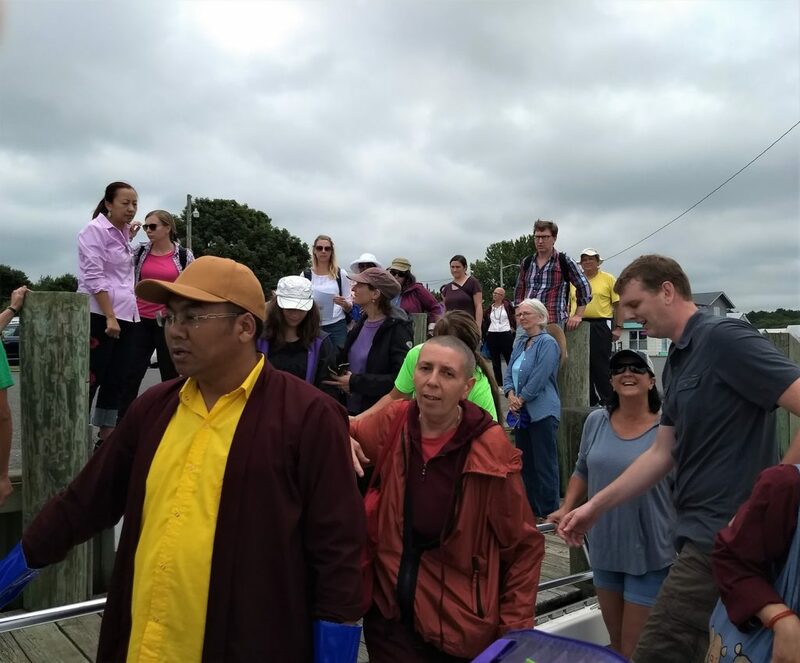 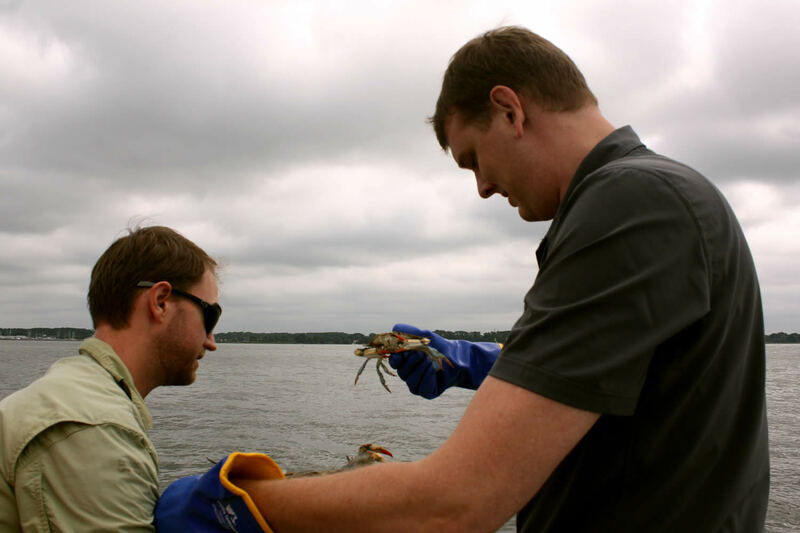 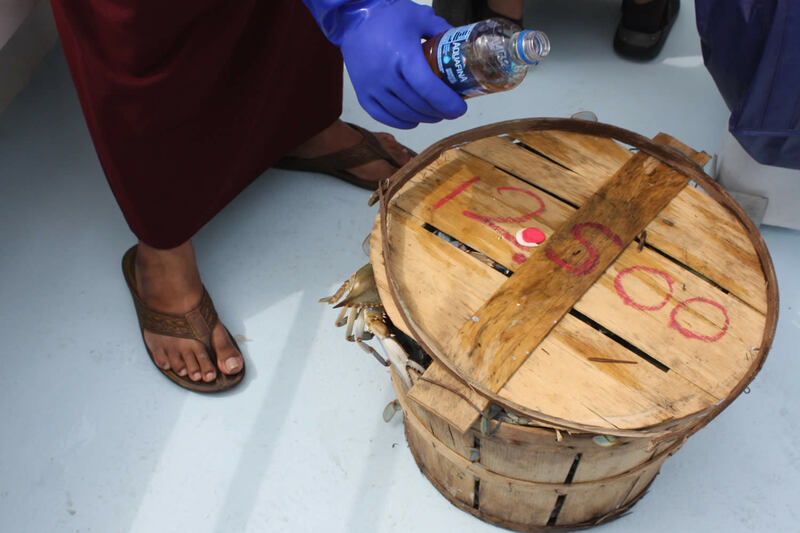 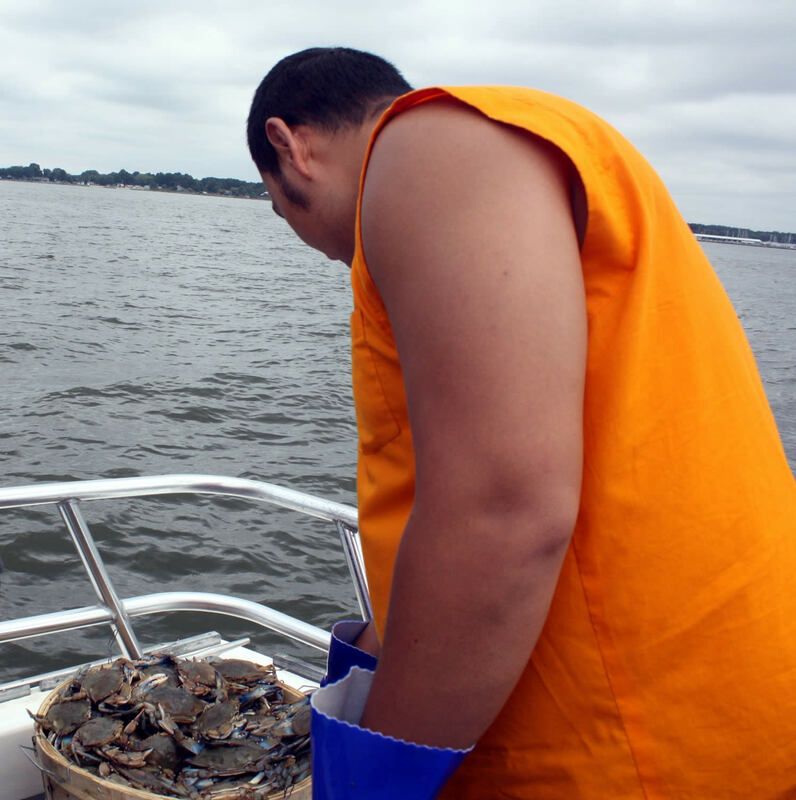 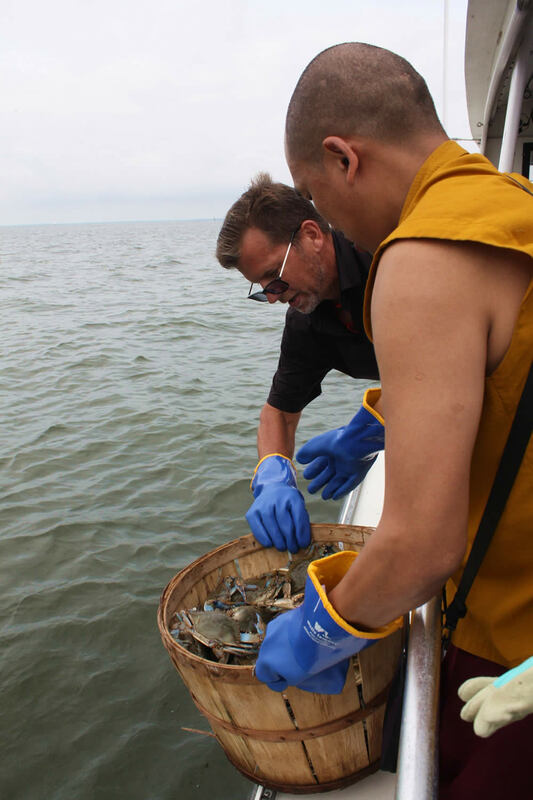 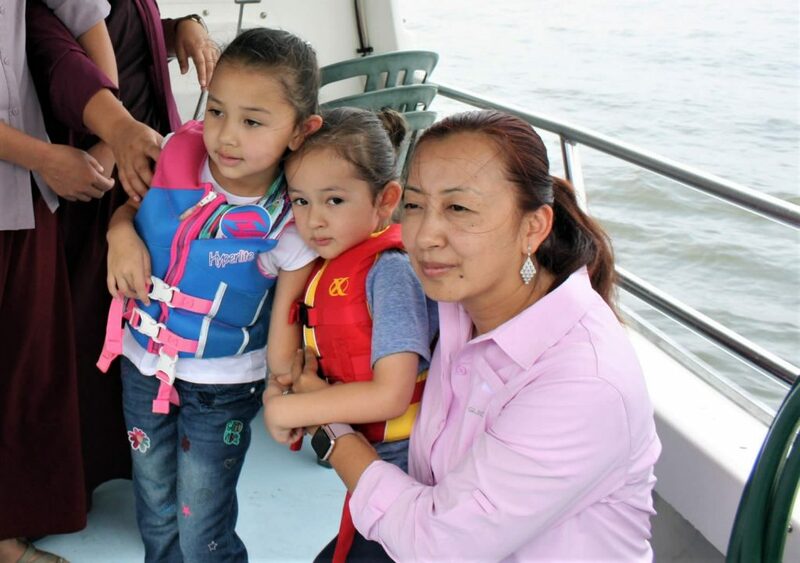 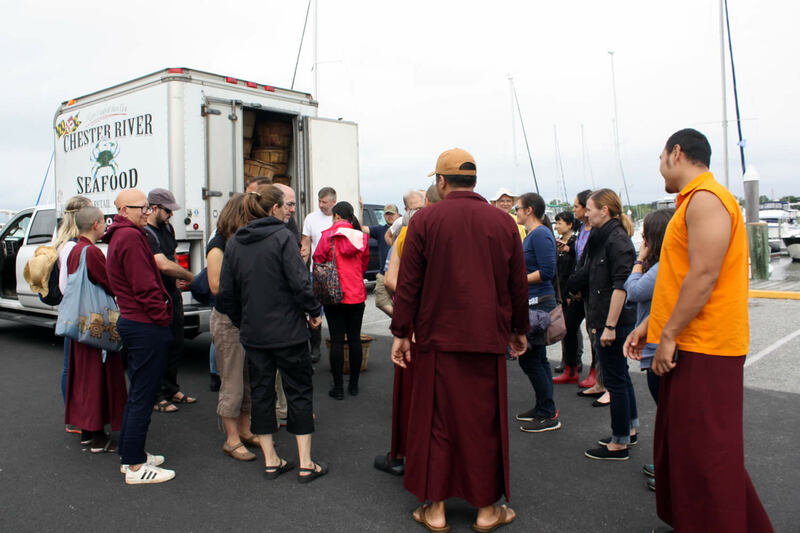 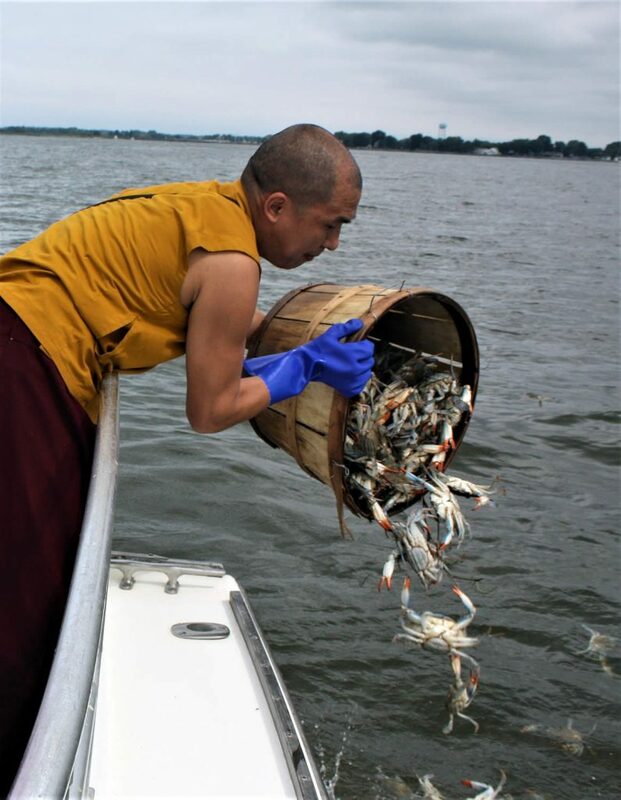 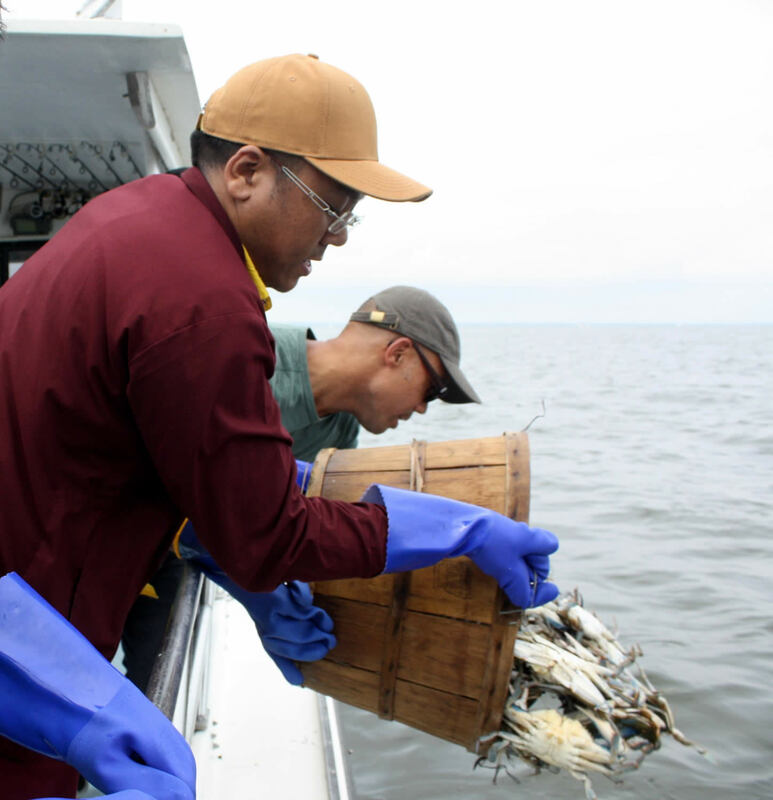 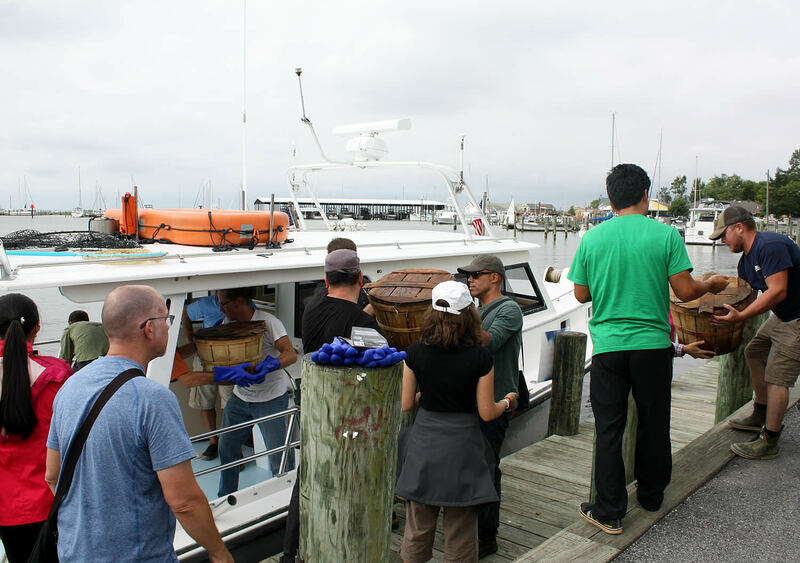 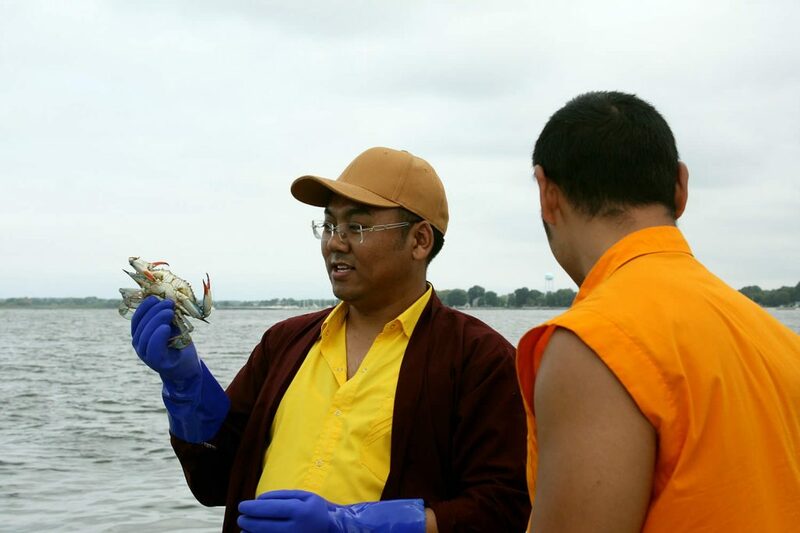 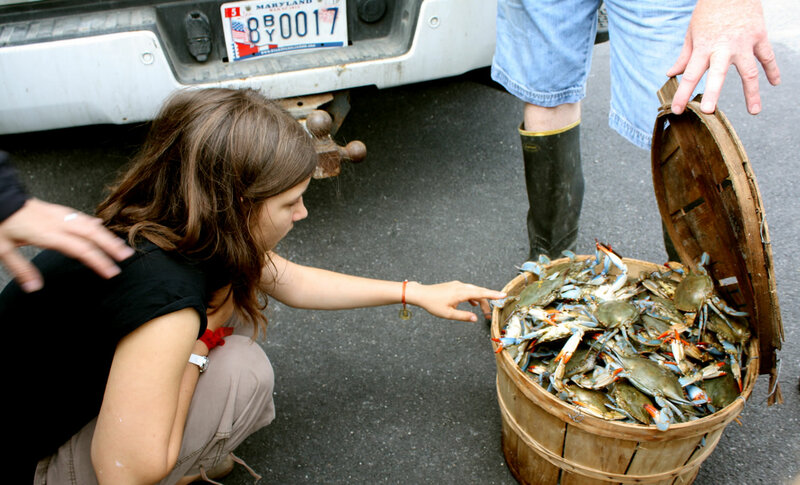 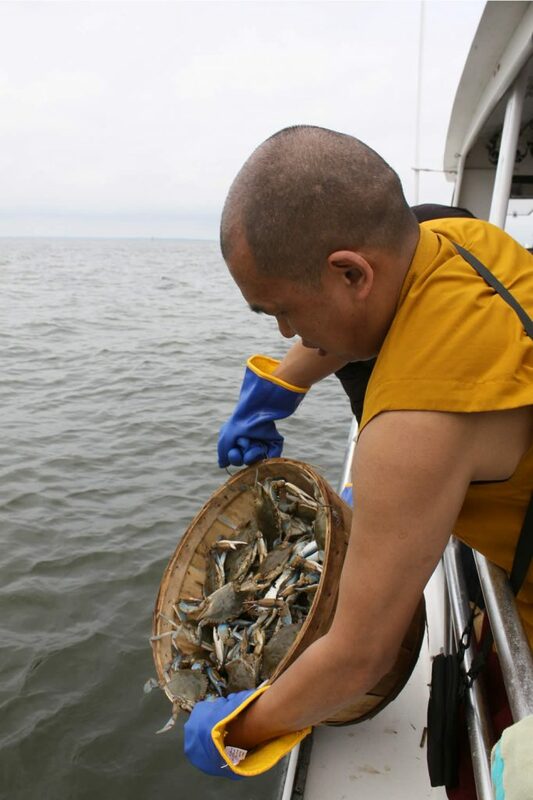 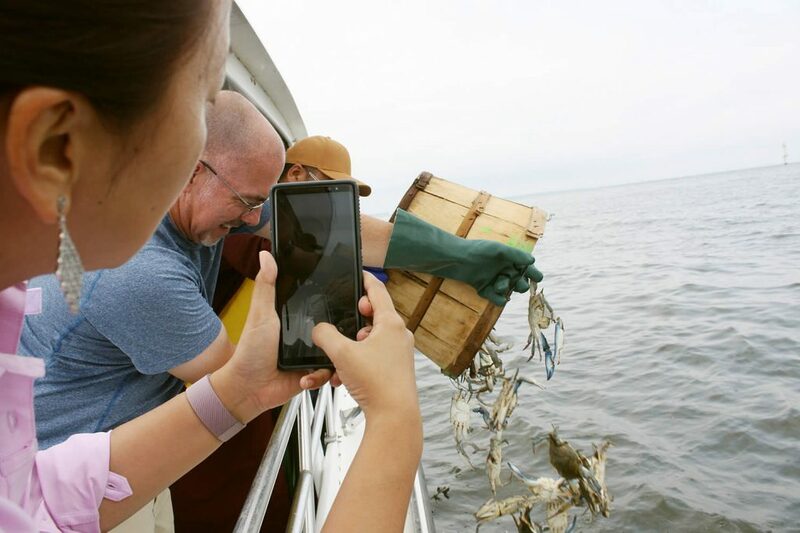 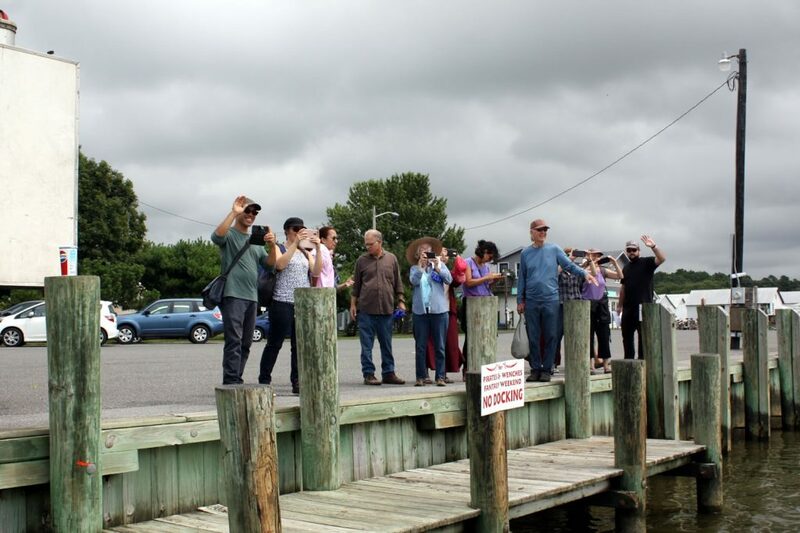 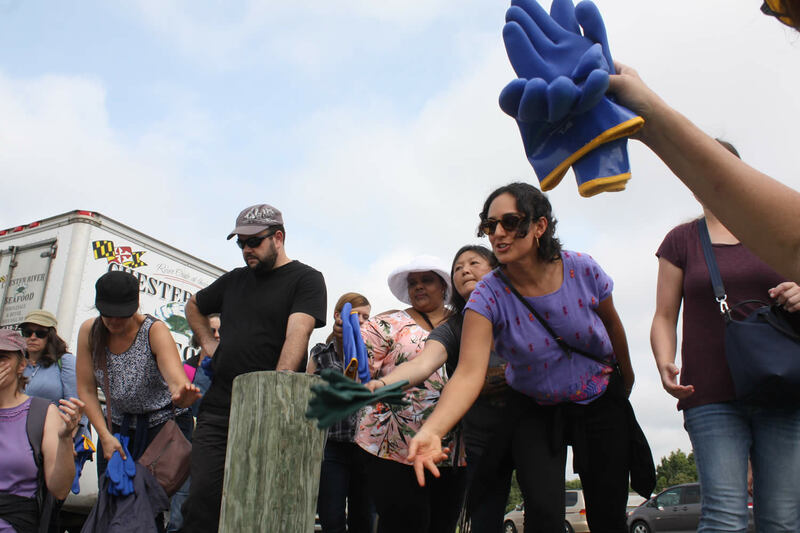 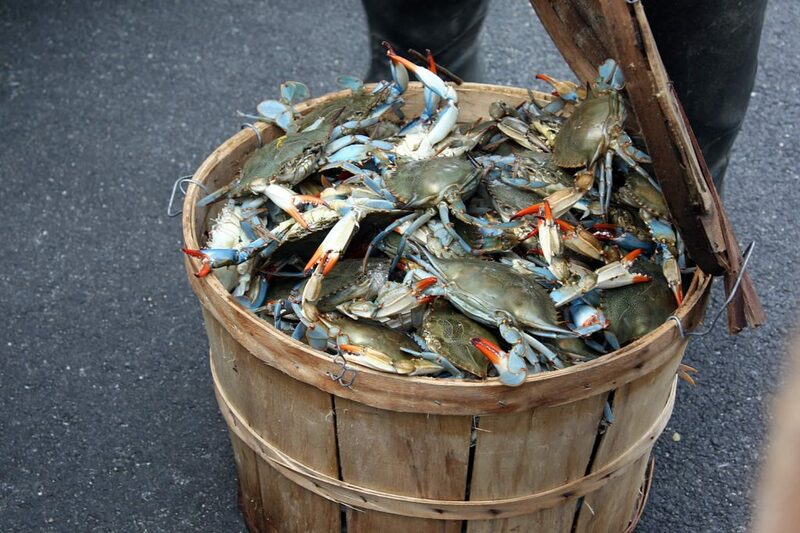 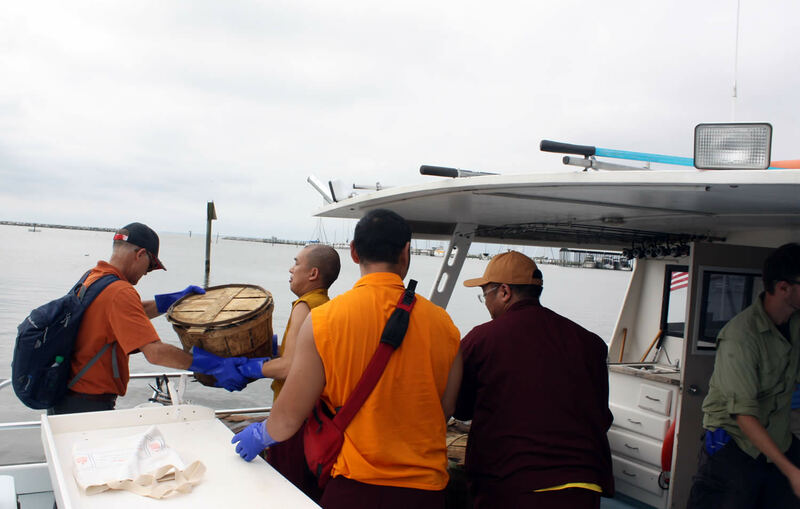 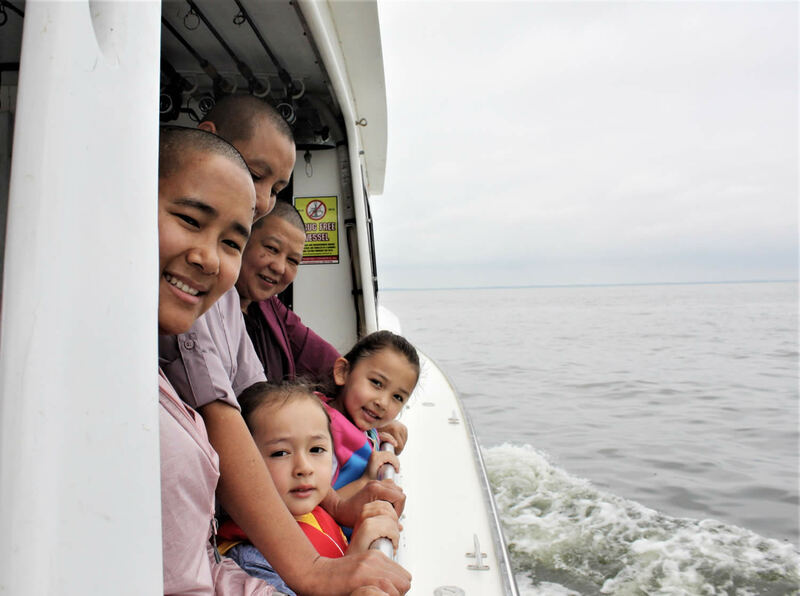 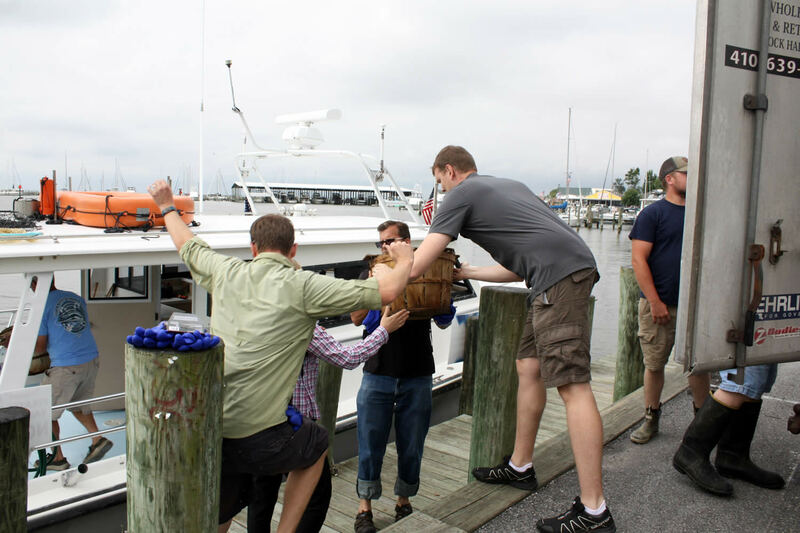 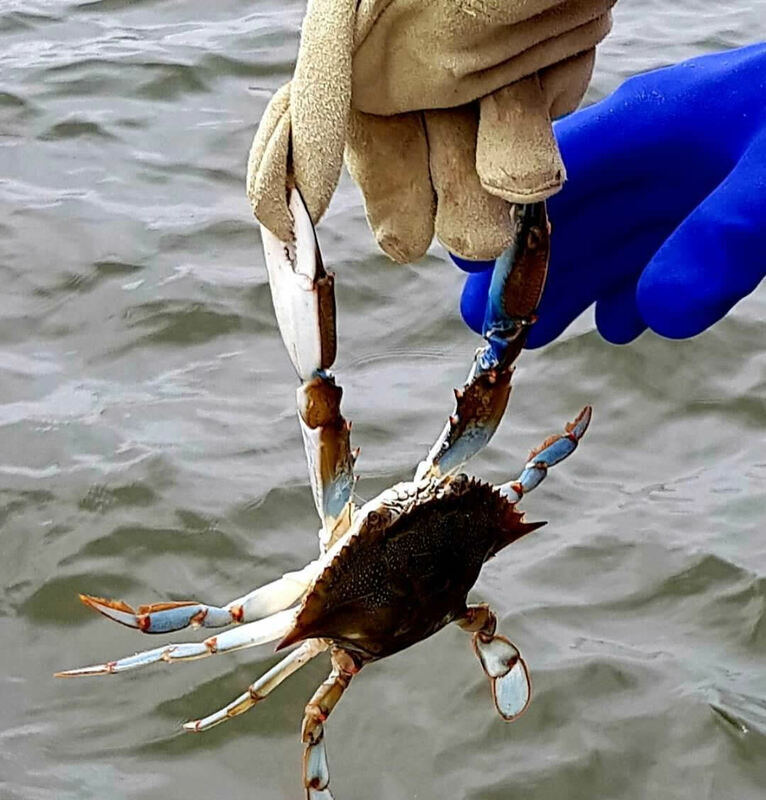 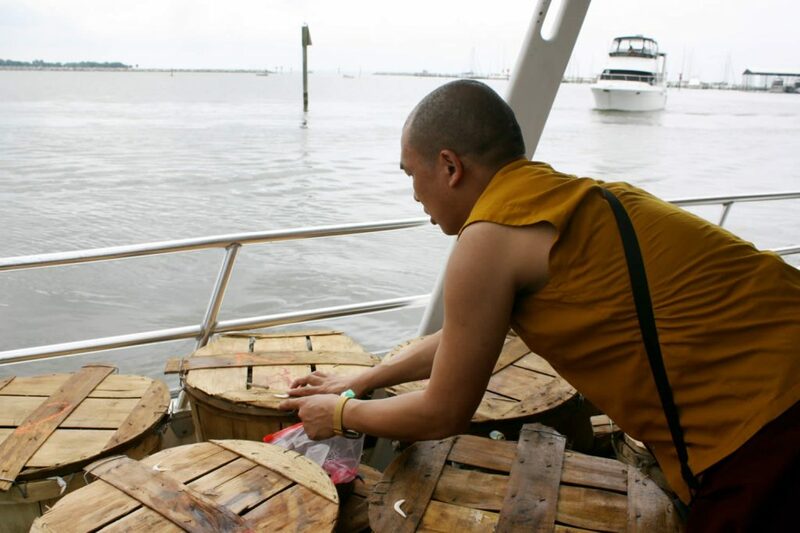 Sangha members wholeheartedly offered donations for the purchase more than 100 bushels of beautiful blue crabs from a local crab fishing business and to rent the boat which would carry the crabs to freedom. 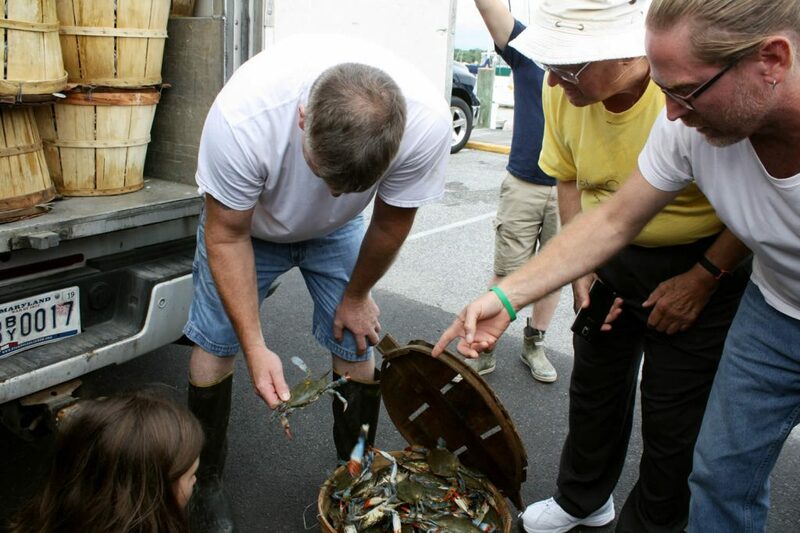 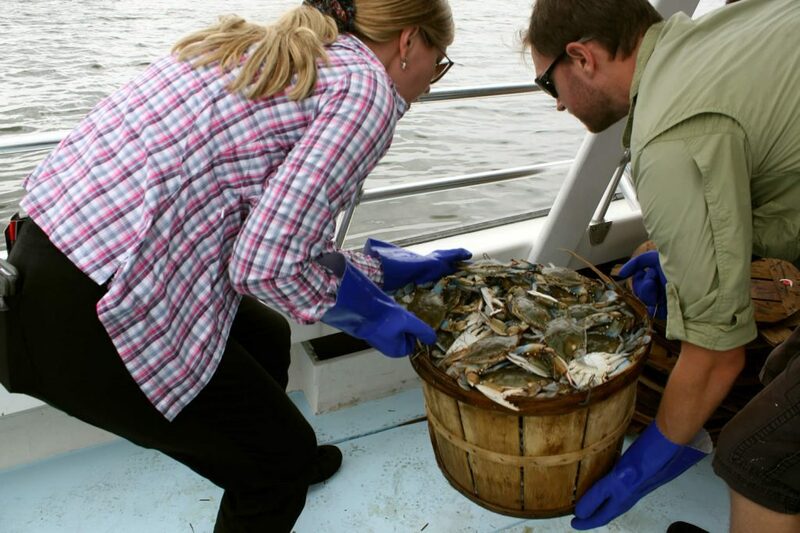 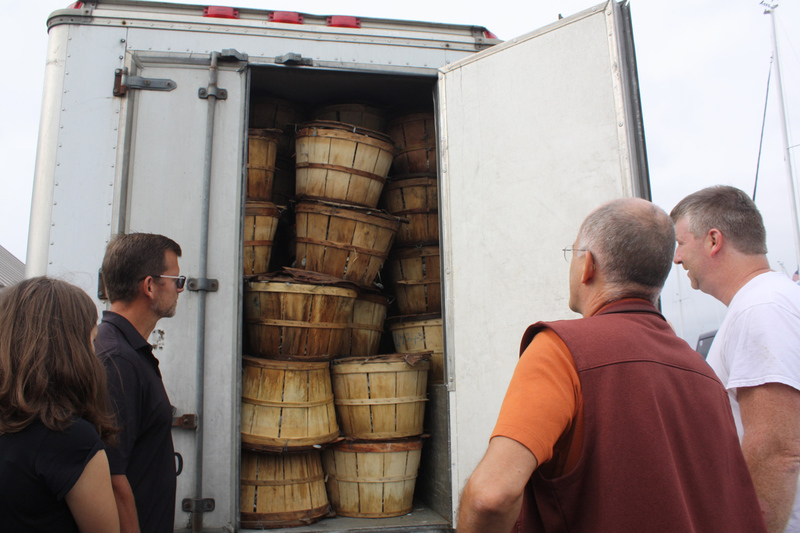 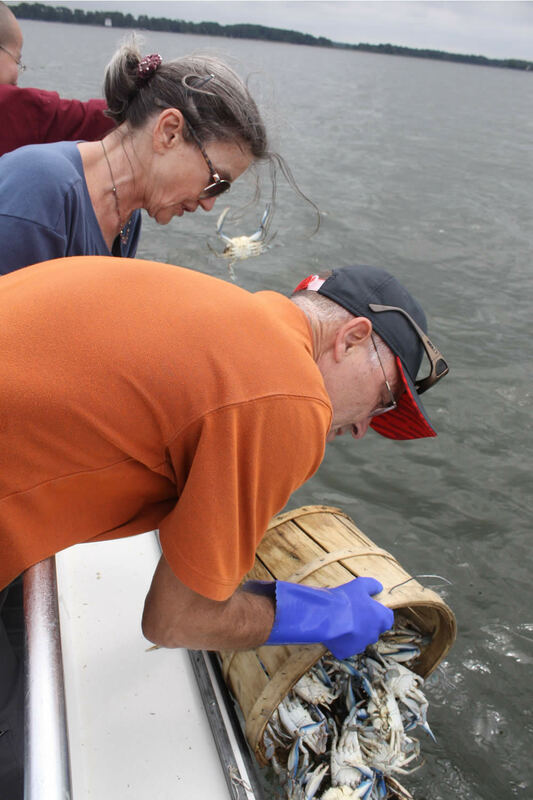 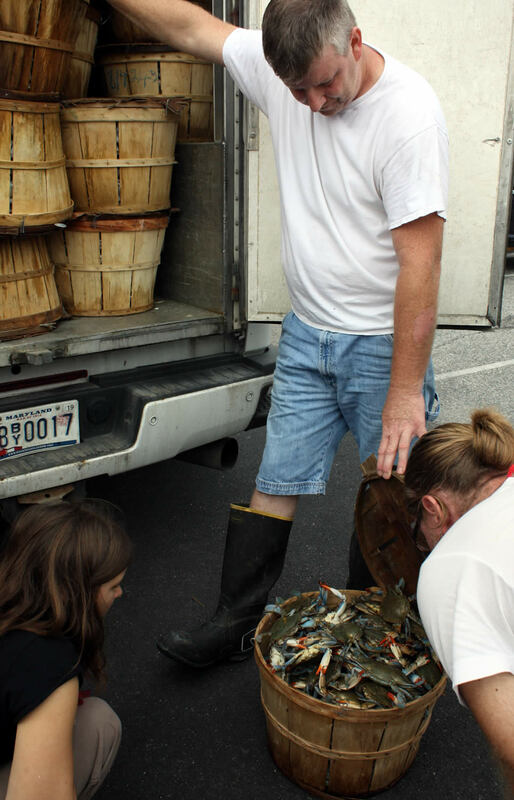 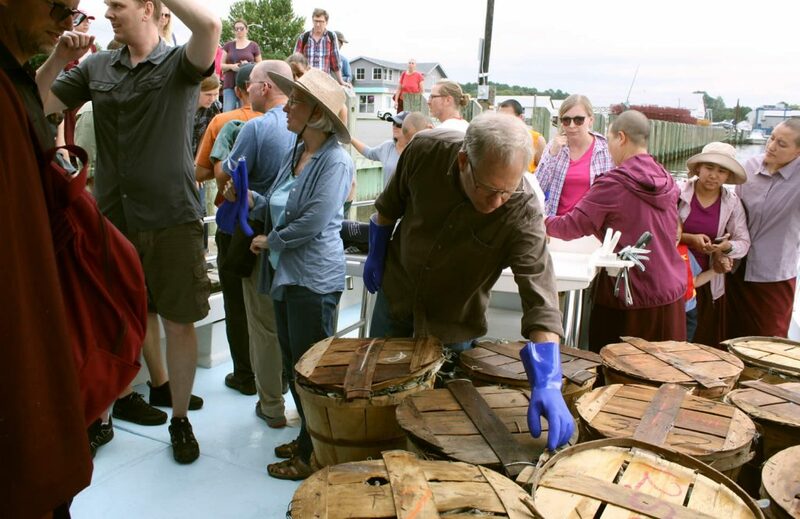 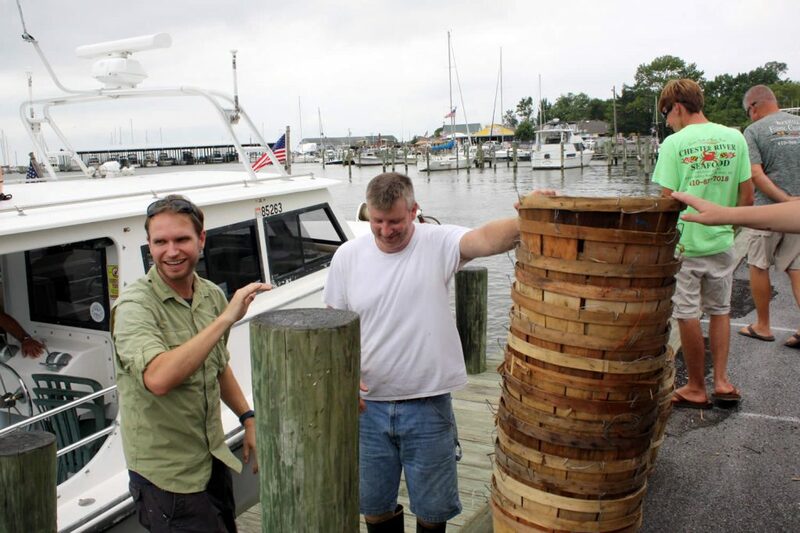 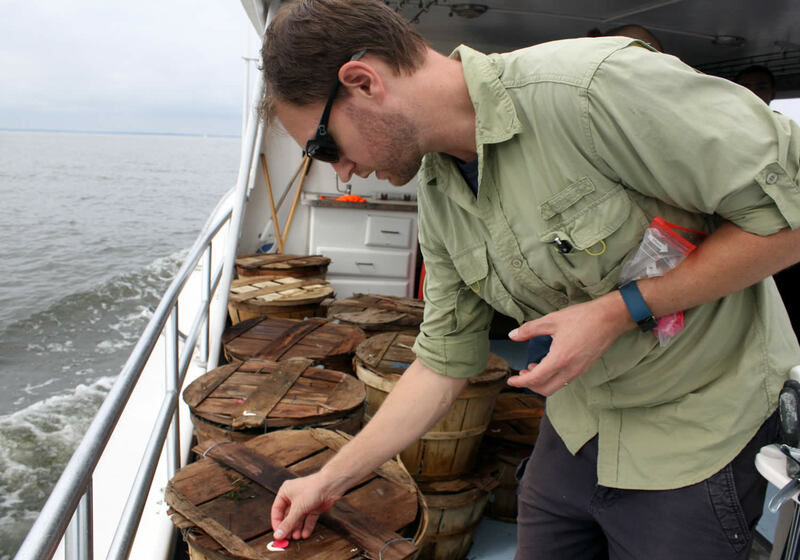 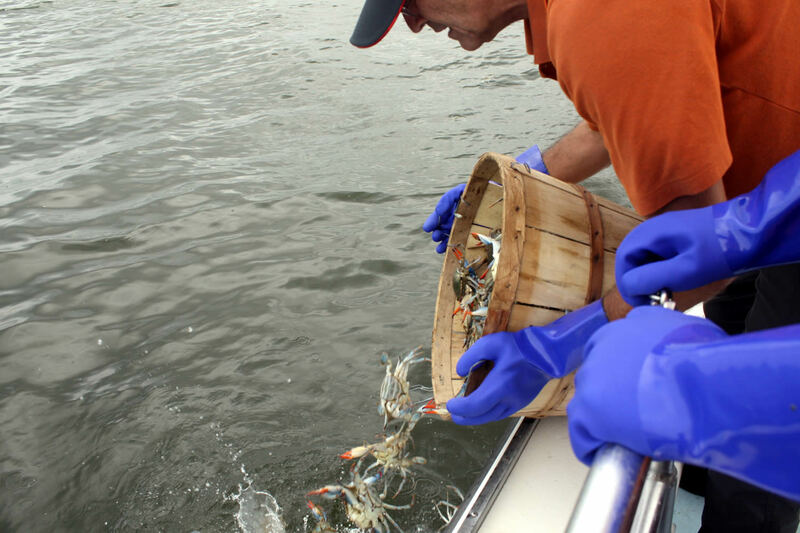 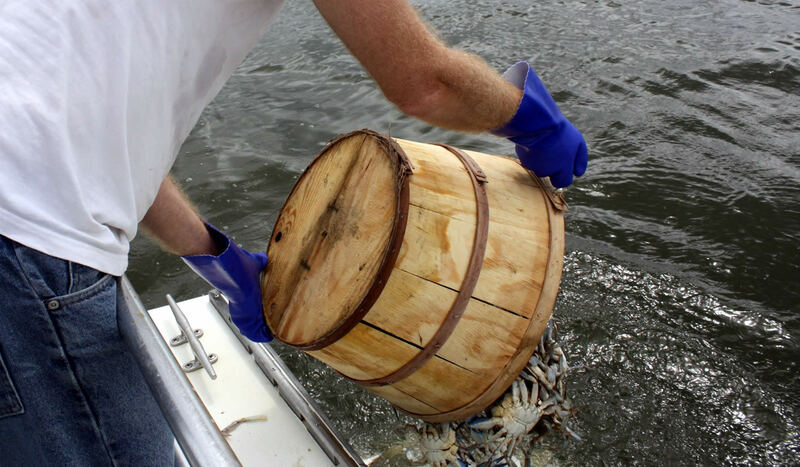 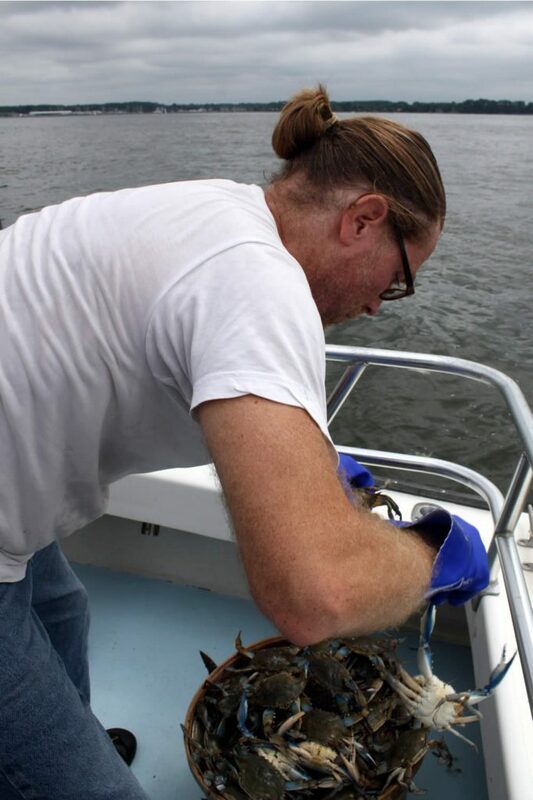 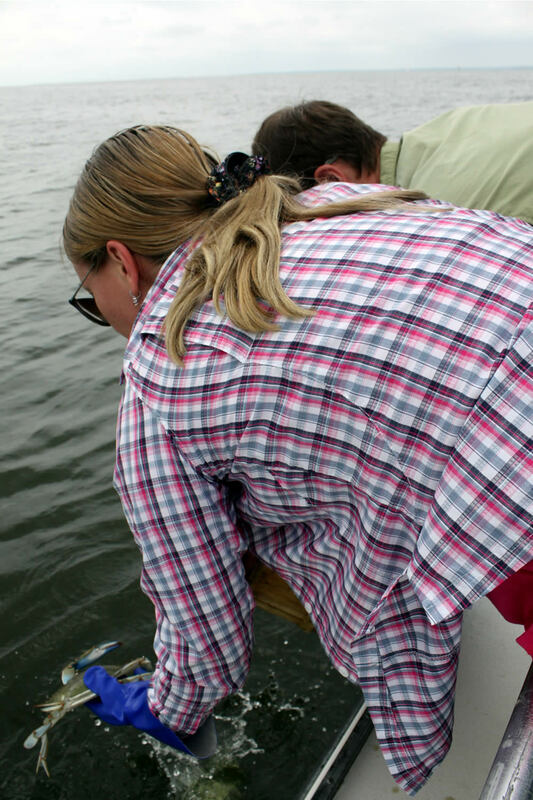 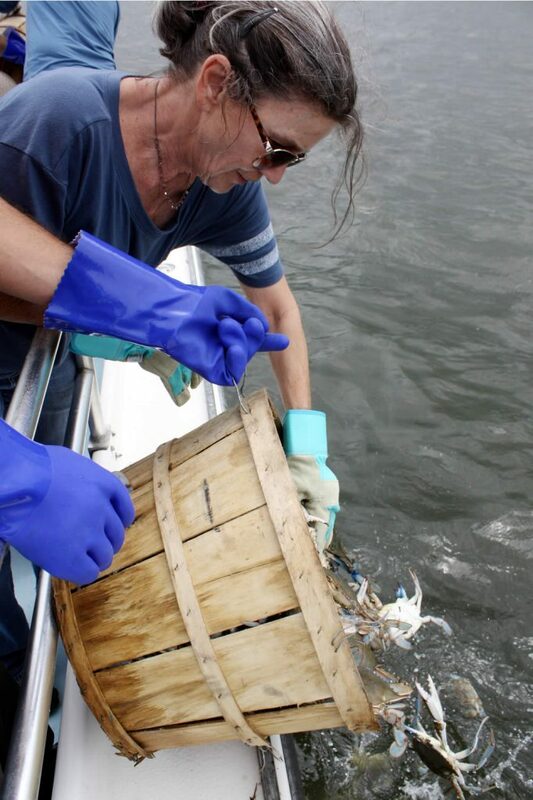 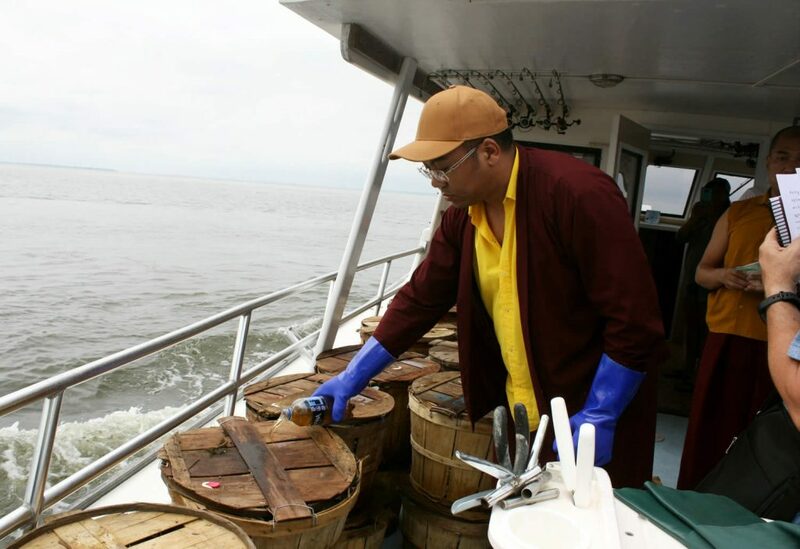 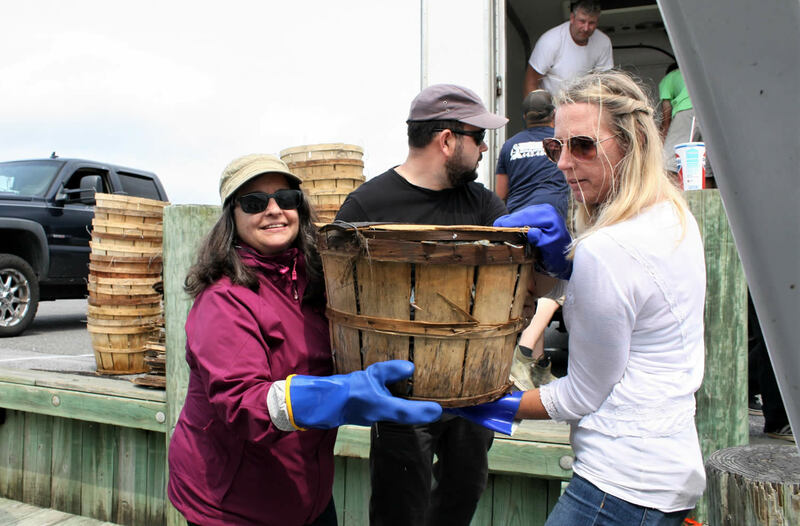 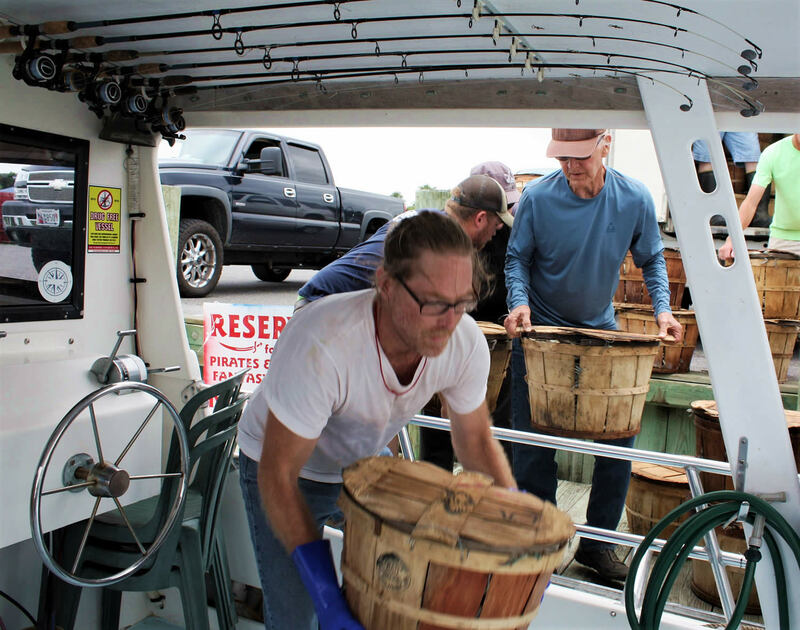 Each bushel contained over a hundred crabs which had been previously caught and refrigerated, and were now headed back to the waters from which they had come. 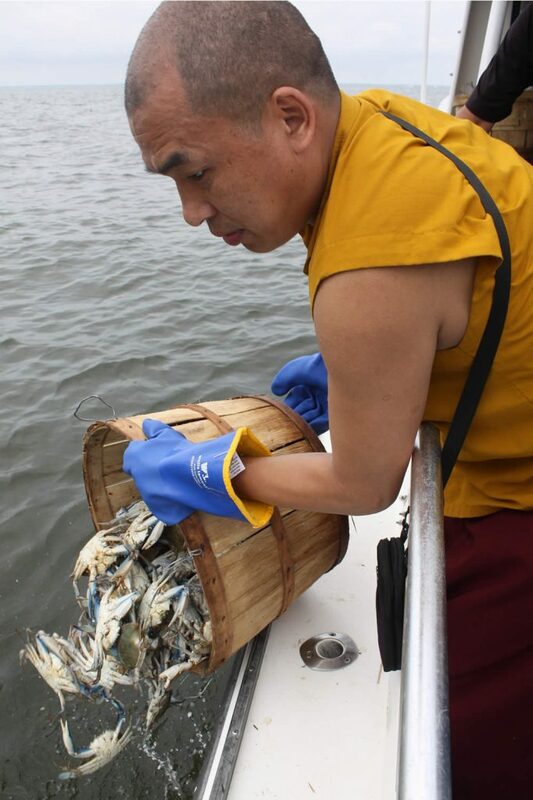 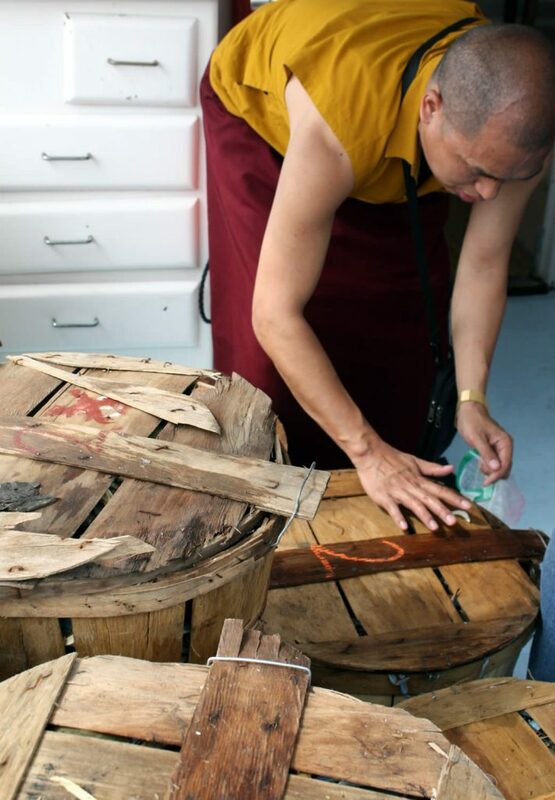 Many thousands of crabs were released by Her Eminence Jetsün Dechen Paldrön, Dungse Rinpoche, Jetsün Rinpoche, Ven. 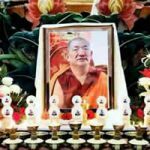 Choktrul Ngawang Jigdral Rinpoche, Ven. 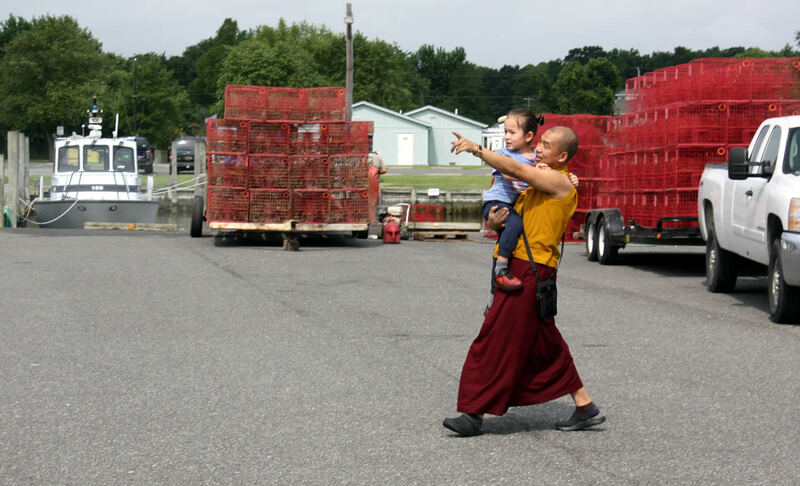 Khenpo Namdrol Gyatso, Ven. 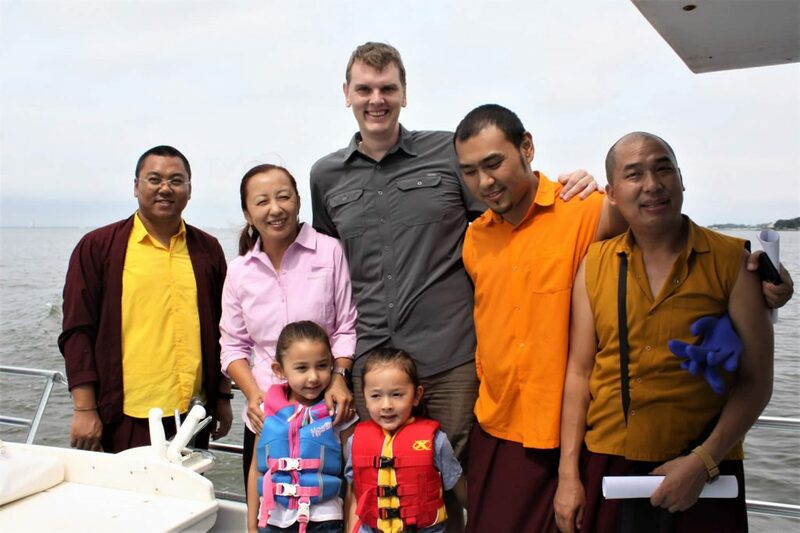 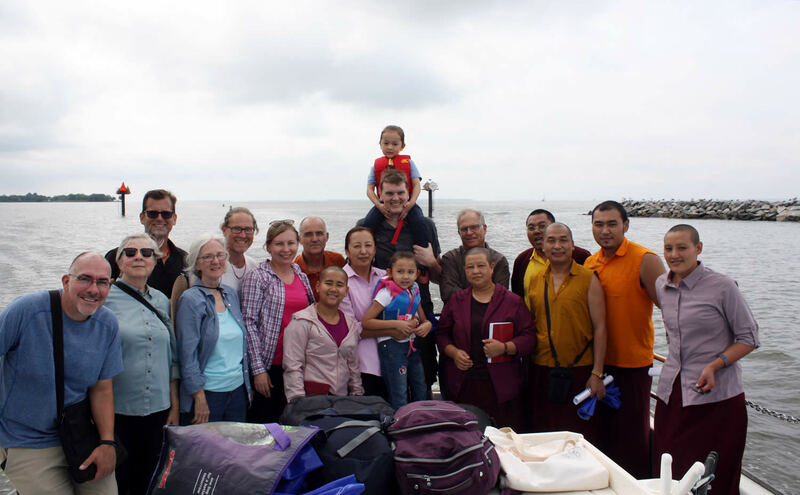 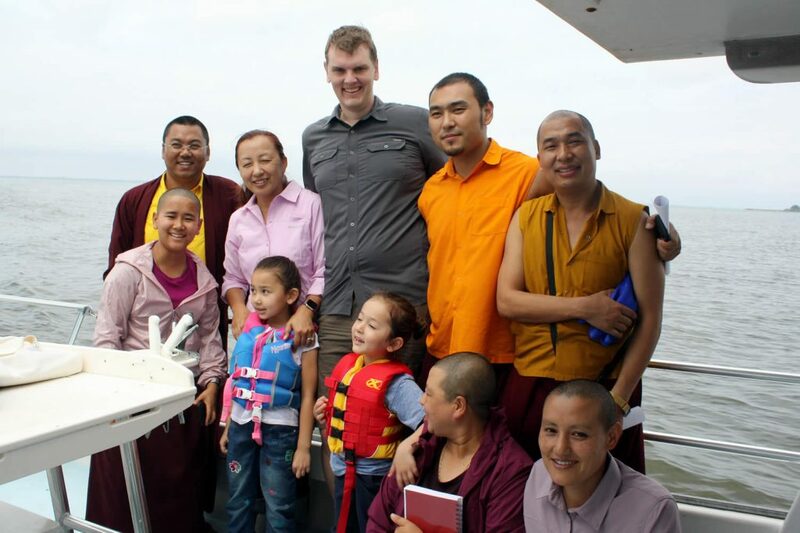 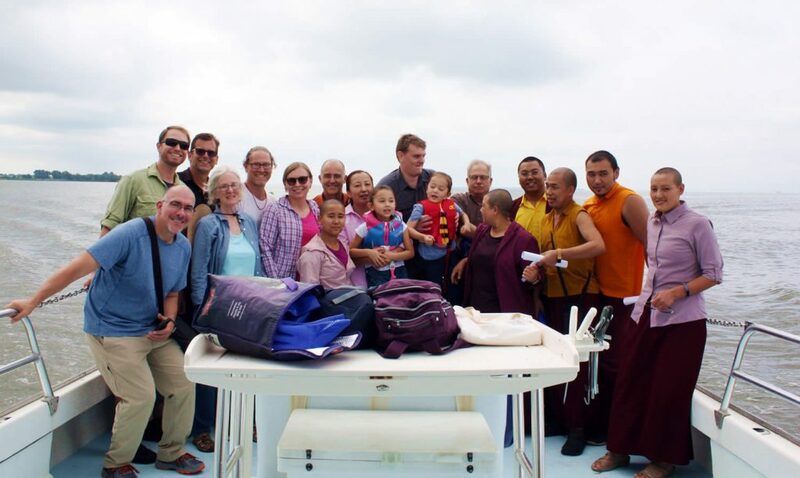 Lopön Thrinley Gyaltsen and Kunda Britton Bosarge la who were joined by staff and sangha members. 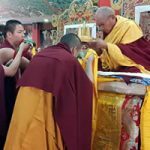 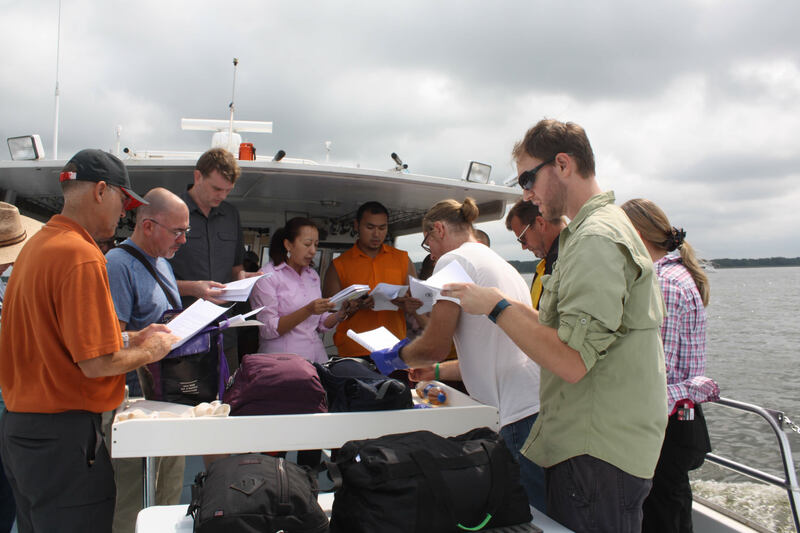 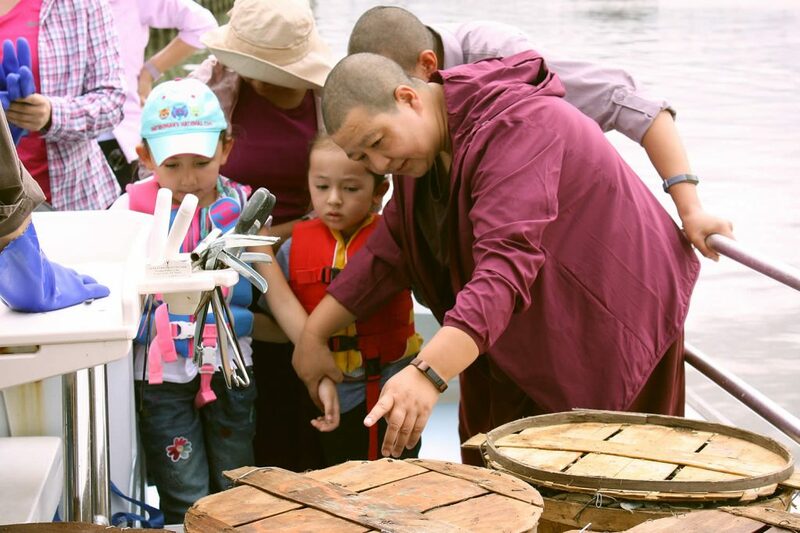 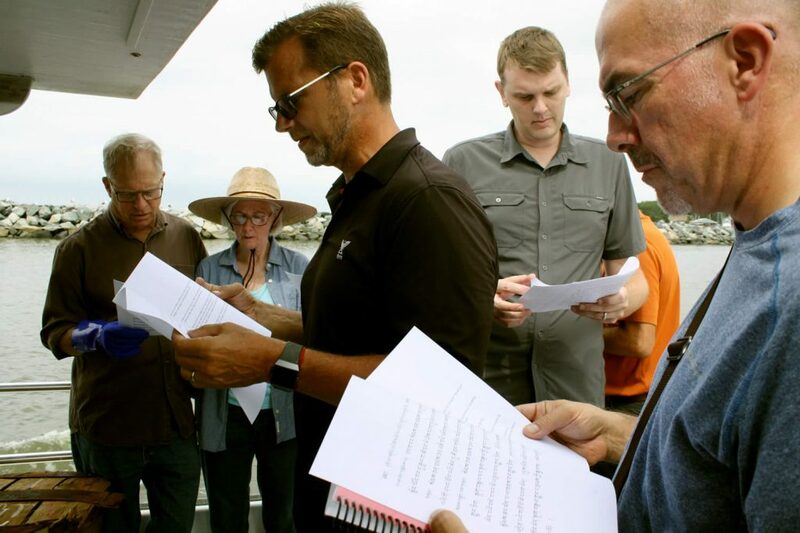 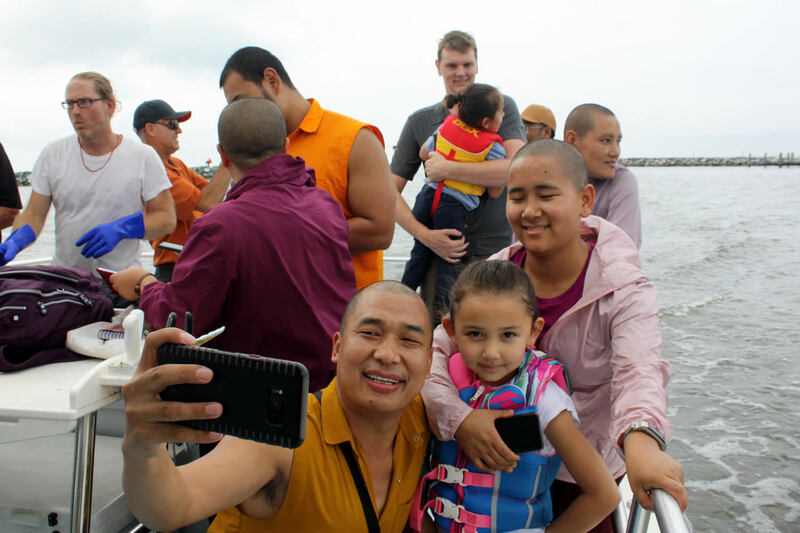 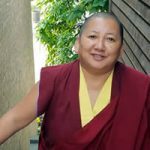 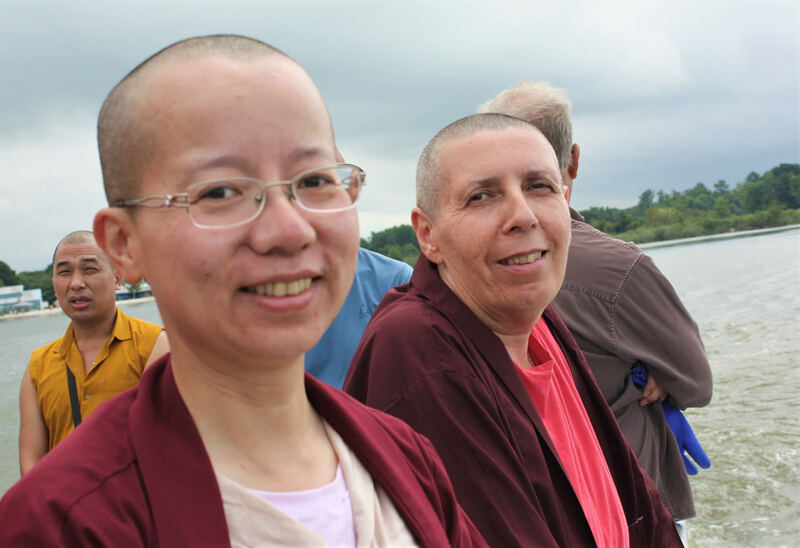 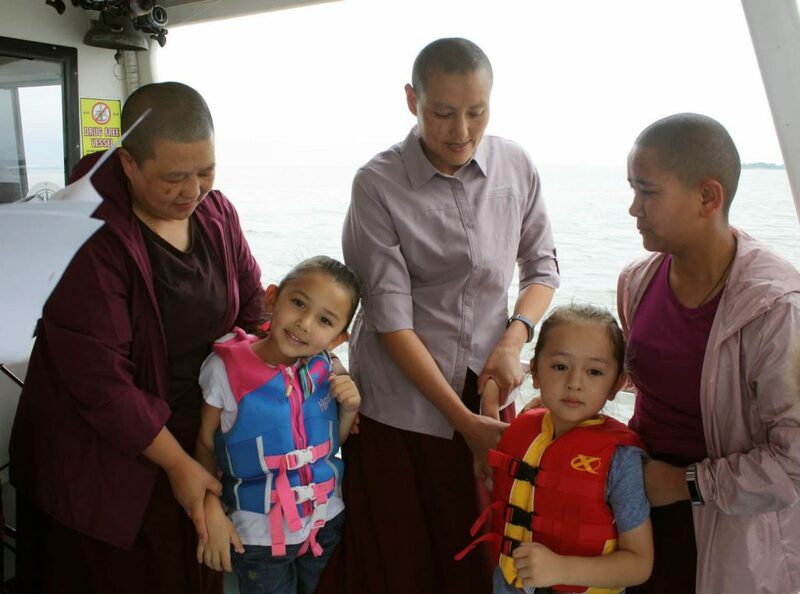 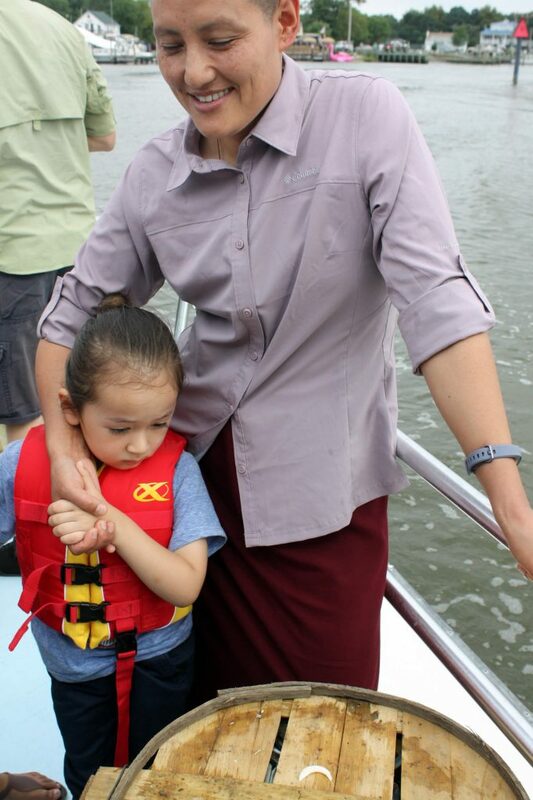 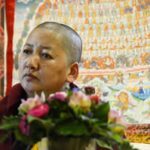 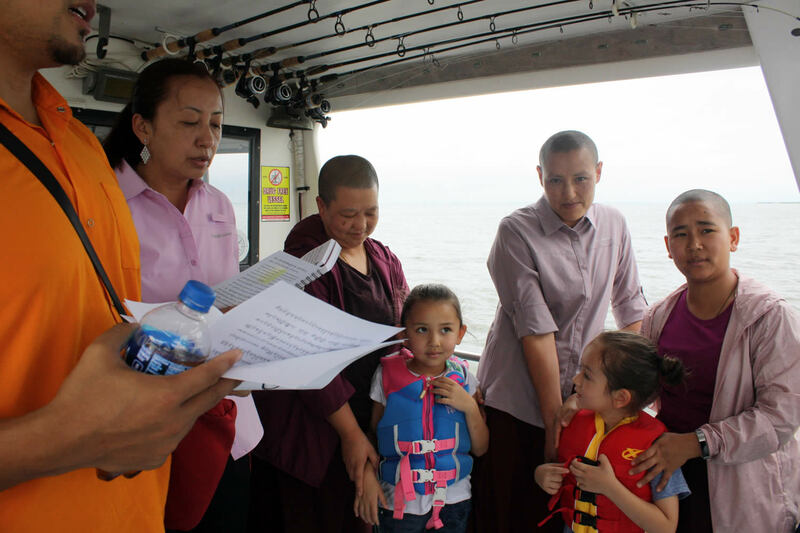 Prayers for Life Release and the Long-Life Supplication to Jetsün Khandro Rinpoche were recited on board the boat, led by Ven. 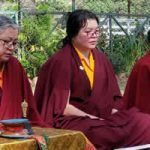 Choktrul Ngawang Jigdral Rinpoche, chief Umdze of Mindrolling Monastery. 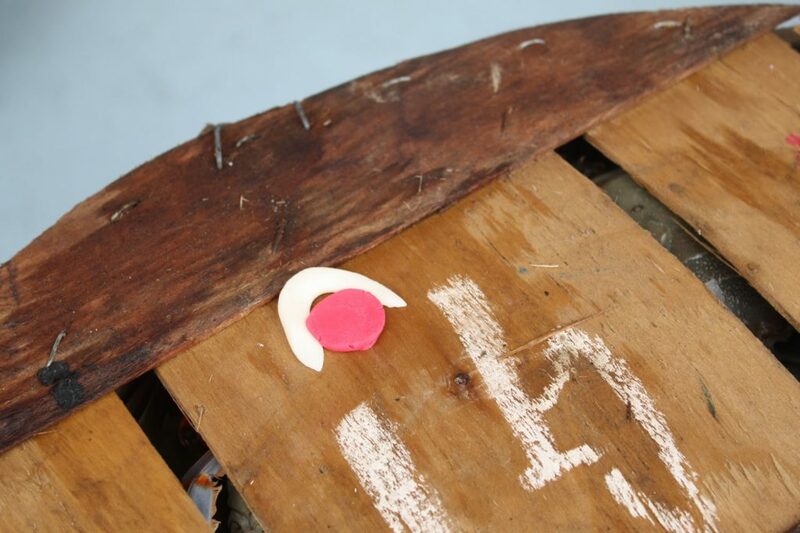 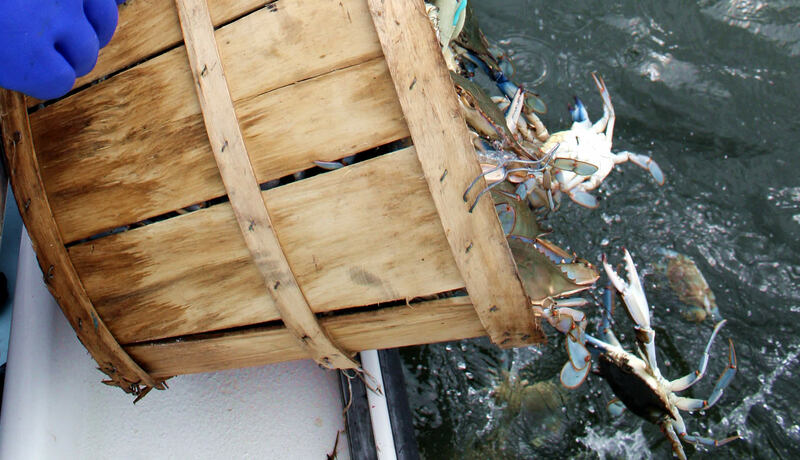 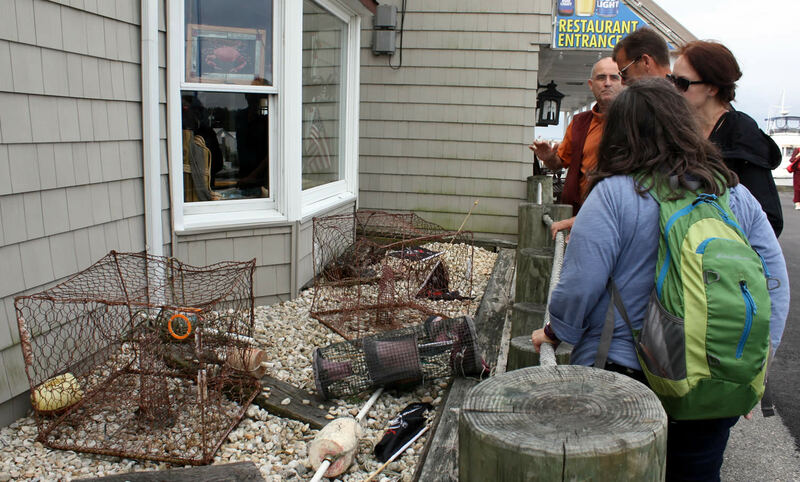 Each bushel of crabs was blessed and marked with symbols to protect them from being recaptured. 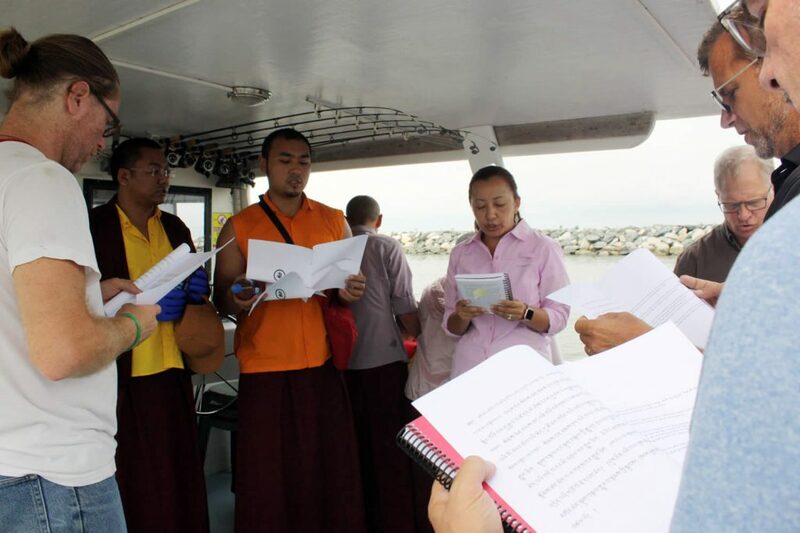 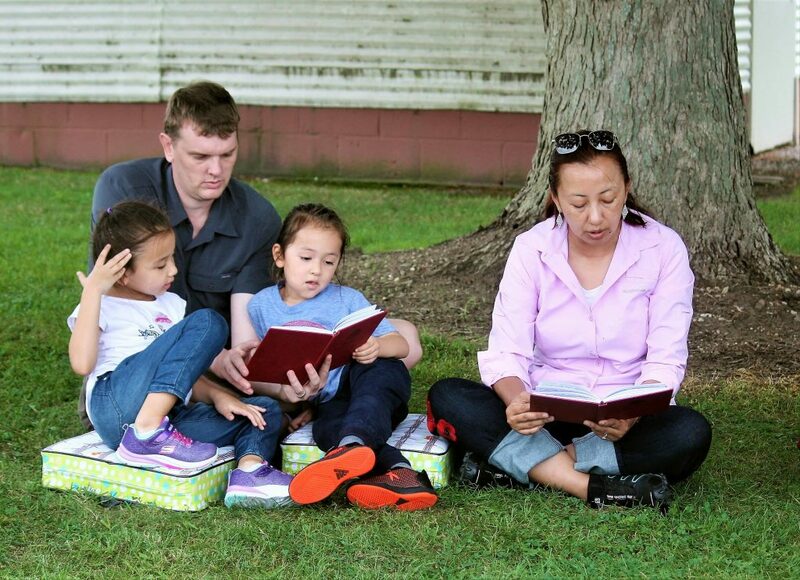 The tsethar ceremony concluded in a nearby park where everyone gathered to recite aspirations. 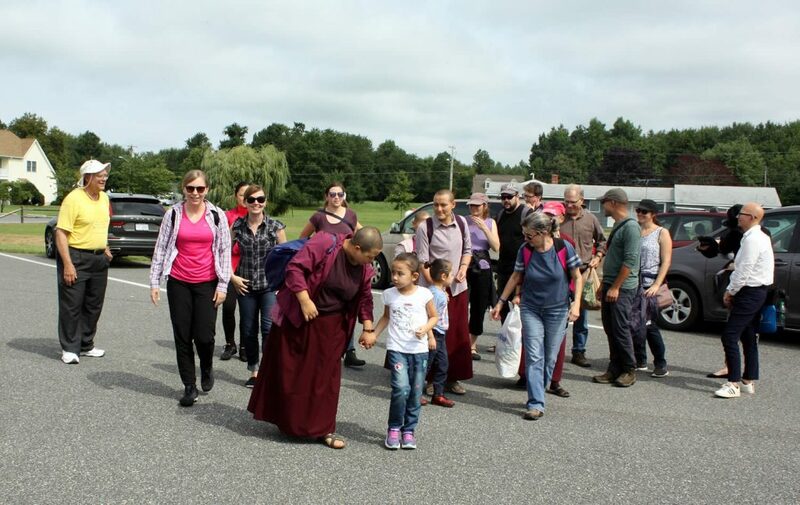 Lotus Garden is delighted that through the combined efforts of sangha members so many lives were released, aspiring that many more such meritorious activities can be undertaken in the future. 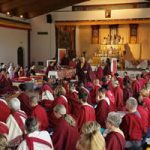 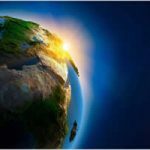 It is hoped, through this act of actively engaging in the application of the teachings of bodhicitta, a seed will grow continuously in the unfurling and blossoming of the two accumulations for the entire sangha. 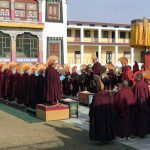 May the peerless Guru’s life be steadfast and long!